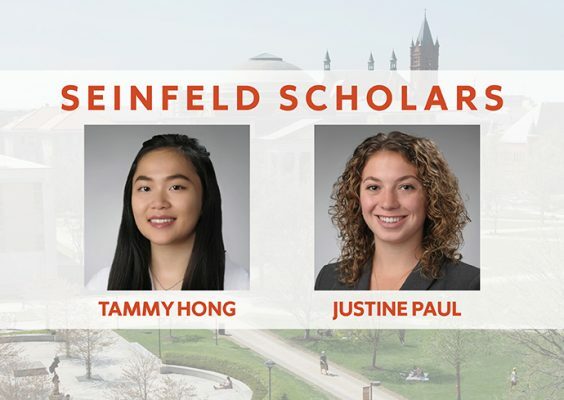 Seniors Tammy Hong and Justine Paul have been named Syracuse University’s 2018 Seinfeld Scholars. Hong is a double major in history ( College of Arts and Sciences/Maxwell School of Citizenship and Public Affairs) and art history (Arts and Sciences). Paul is a bioengineering major in the College of Engineering and Computer Science. The Seinfeld Scholar Program recognizes those who have made outstanding contributions to the beauty of the world, to human values and to ending human abuse anywhere in the world, and acknowledges the recipient’s passion for excellence, creativity and originality in academic or artistic fields. Those chosen are determined to have the ability to motivate and bring out the best in others. Designation as a Seinfeld Scholar is intended to encourage and stimulate future contributions to society. Students are eligible for the award every three years. Each recipient receives a cash prize. A committee of faculty, including previous Seinfeld Scholars, reviewed student nominations and recommended graduating seniors for the honor. During her years at Syracuse, Hong, a member of the Renée Crown University Honors Program, has successfully blended her academic and artistic interests. Hong studied abroad in Florence in spring 2017, and has been a researcher, curatorial intern and guest curator in SUArt Galleries. She has participated in the painting of a fresco in Florence, explored the history of a shipwreck and written her capstone project about Ivan Meštrović, a Croatian sculptor whose figure of Moses is installed in the University’s sculpture garden. Through that project, Hong examined the impact of tragedy on memory, place and artistic practice. She has worked in museums in New York, Florence and Guangdong, China; is an active member of the Phi Eta Sigma honor society and Phi Alpha Theta professional society; was a teaching assistant in the Honors Program and was an editing staff member for the Chronos Undergraduate Journal in the Department of History. She was a University Scholar nominee in the College of Arts and Sciences and a Wortman Scholar in the Department of History. She was also the recipient of the Outstanding Student Research Paper Award at a poster session in the Maxwell School. After graduation, Hong will join the Summer Fellowship Program in History and Material Culture at Historic Deerfield. Justine Paul is pursuing a rigorous curriculum in bioengineering and has a 3.7 grade point average. An accomplished student researcher, she has worked at the Syracuse Biomaterials Institute and at the University of California, Santa Barbara. At the University, Paul has gone beyond the boundaries of her curriculum to pursue interdisciplinary experiences, including taking a graduate level course in the School of Architecture. As part of that course, she was a key architect in developing and building Sustainacuse, a participatory laboratory for sustainability that was located in Bird Library. The goal of the project was to create an interactive, immersive installation integrating sensors and responsive systems with virtual and/or augmented reality technology to engagingly communicate sustainability and resilience content to a participatory audience. Paul was integral in the electrical and programming portions of the project, including building circuitry and writing appropriate code. Paul has worked as an undergraduate student researcher in the lab of James Henderson, associate professor of biomedical engineering in the Department of Biomedical and Chemical Engineering. There, she has assisted doctoral student Shelby Buffington in her research and successfully completed an independent study project on enzyme-responsive shape memory polymers, which offer great potential to impact diverse areas within the field of biomaterials. She is a University Scholar and a Remembrance Scholar, two of the most prestigious honors bestowed by the University. She has also held leadership positions with the Phi Eta Sigma honor society and Engineering World Health. “As a student who has performed in the classroom at a level beyond those of all but a few students, who has performed research of a quality only a very small percentage of undergraduate researchers achieve, and as a student who has performed service both without fanfare and in the University’s brightest spotlight, I consider Justine to be highly worthy of the designation of Seinfeld Scholar,” Henderson says. Upon graduation, she will pursue a Ph.D. in the Department of Materials Science and Engineering at the University of Illinois Urbana-Champaign.